There’s a legitimate complaint that many Black men have had with Black women. A complaint they kept bottled up inside until the emergence of the Internet became mainstream and they could be vocal about it to the masses. This complaint has to do with having to bear witness to many negative Black women going to the media and making Black men look bad, by talking about how negative they are. They have held a great resentment to this and felt emasculated and attacked by it. Many Black men felt Black women began to wear the ENERGY of siding with his oppressors because of it. I accept the resentment Black men developed as a natural understandable reaction. It’s important for us to protect each other and positive Black women did nothing to intercept this phenomenon that occurred via talk shows, movies, T.V. shows and even news programs. Granted the women who did this, were being exploited and paid to do this, but it’s still something that should have been addressed. When we don’t water the seeds of good, negativity will seem to dominate. Trying to intercept the negative perceptions that were being created would have been an opportunity to honor all the positive Black men who tried to be good men amongst the negative ones who didn’t. It would’ve empowered them to become even stronger because people find strength in being acknowledged and appreciated. The media and those who are truly in charge of this world, wanted the exact reaction and consequences to occur that we see today. 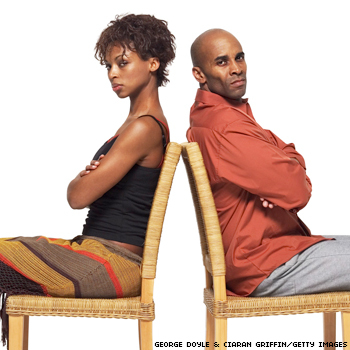 Consequences that are destroying the bond between Black men and women. We failed as Black women and fell into a trap. Though I can be likened to a young bystander in my formative years during this phenomenon. A phenomenon that occurred in the media during the 90’s and early 2000’s, I feel there is still a need to say “sorry” to positive men for not honoring them. Positive Black women, through passiveness and ignorance to the consequences of permitting negative seeds to be entertainment to the masses, allowed negative Black men to dominate over the existence of more positive Black men, then we eventually allowed them to take over the culture with the assistance of negative Black men. Here’s the question will positive Black women experience the same and pay the same price? Will Black people wear the ENERGY of gang members and simply go back and forth in retaliation until we exhaust ourselves? Well, as I’ve stated many times before, I live in a predominately White neighborhood and there seems to be a growing “air” of dismissiveness towards Black women when it comes to our validity. We seem to stand alone with no protection. Each race of women is either protected or shunned by the men of their race. Most men will protect the women of their race and not speak out against them or hold women of other races at a higher esteem. Now we know the opposite is happening to Black women more and more each day. It’s to the point where I’ve been around White women and they have the ENERGY of feeling superior to me as a Black woman, no matter how they look. No longer do they simply find this sense of superiority from the men of their race, who have economical dominance over other races, they now gain this validation through Black men. Increasingly Black men are praising White women and non-Black women over Black women. This has empowered White women in this era to openly look down on Black women. It’s like you can’t tell them “nothing”, because they have been made to feel better, both physically and character wise. They are in a position where all the faults they have seem to be covered-up and protected. You have many White women walking on an air of dominance like “oh my God, I am so beautiful and wonderful even Black men praise men, they like me over their own women.”. This takes power away from not only negative Black women but positive Black women also. Of course as a conscious person, I must mention, these women are simply having their egos fed, they don’t truly desire Black men beyond the experience and the irritation it brings to Black women. They are sucking all the praise from Black men like a vampire, but will not be able to uplift and empower Black men. So my question is, will this bring resentment to positive Black women? The last strong cord amongst Black females that bring a sense of sanity and hope amongst all the other Black women who are lost? I can tell you personally I am irritated by this, but because I am conscious of how this has occurred I know it’s an illusion waiting to be exposed. I’ll even emphasis through ENERGY to a White women that they’re only being praised through frustration, not due to legitimacy of this praise. Frustration brings with it the need to attack and White women have become a tool to do just that. There are some Black men who think beating down the spirit of Black women will get them to change or get positive Black women to change the negative Black women around them. They would never in their wildest dreams understand the repercussions to what they are doing. At the end of the day the spirit of all women of this race is put to the test. Others are not going to be discerning or make a an attempt to distinguish between different types of Black women like Black men attempt to do. It’s like Black people who go to a restaurant and…… wait and wait and wait…… to be seated or served by a waiter. As a former waitress I can distinguish between a ghetto Black people and those who are not, others cannot do this with as much effectiveness. All they see is Black people, and they will treat them differently based on the stereotype that “Black people don’t tip well and sometimes at all”. Just to be honest, this is a true statement in general when it comes to a certain class of Black people. So understand that these servers aren’t being racist, they are simply ignorant when they judge all Black people the same. All they see is color in a situation where personalities aren’t necessarily revealed. As a Black person I was able to make distinguishes because I am Black and don’t just see color, I observe character through ENERGY. In other words in a situation where split second assessments are made a Black person can judge another more accurately and won’t dismiss Black people that others might dismiss. You have the opportunity to cease what could become a gang ENERGY cycle by standing up for and protecting the image of positive Black women in the community. It will put you in that true leader position. Not every woman is as perceptive as me and other more conscious Black women. Downplaying the image, beauty and great characters of positive Black women, no matter how few of them seem to exist, will be like pulling these seeds out of the ground and throwing them away. At that point only seeds of negativity can grow, which only creates weeds. There’s a reality of many successful Black women who have tried to have good characters seeking to look outside of their race because they feel dismissed by many Black men and they don’t feel acknowledged. Just like when negative Black women decided to down Black men without protecting the image of positive Black men these women feel the same sense of not feeling appreciated. If we decide to go back and forth by being passive to protecting the good in each gender, this will not be intercepted by society. It will merely become entertainment for society and give others the right to feel superior to this race, as many feel this way now. As with all things I simply convey the ENERGY of things and messages from the Universe, so I can see that this is a developing problem. We can do it Black people! Lets become more cerebral and effective when it comes to our problems instead of allowing emotion to drive us into chaos!